Threat: 508 Park Avenue and 1900 Young Street were the subject of an application for demolition last year. 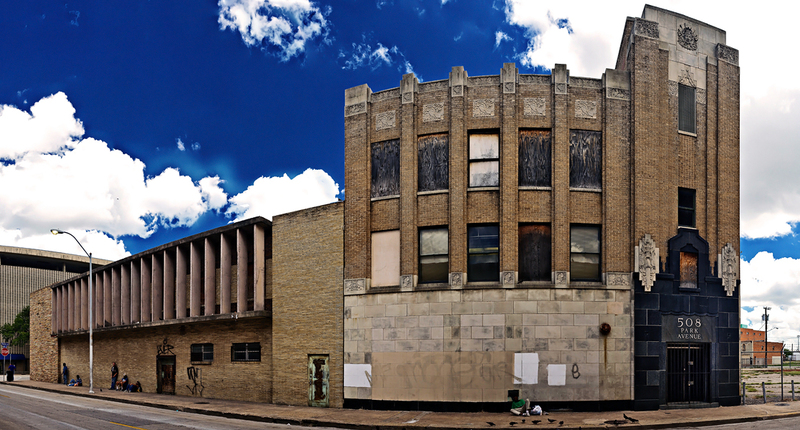 The demolition certificates were denied by the Landmark Commission, and upheld by the City Plan Commission. 508 Park was built in 1929 as the Warner Brothers Film Exchange. It also served as lease space for Brunswick Record’s regional distribution center. With its Zig-Zag Modern detailing, the Art Deco edifice is one of the best examples of this type of architecture in the city. Also, the building has significance for its association with giants in the music industry including Art Satherley (inducted into the Country Music Hall of Music in 1971), famous record producer Bob Wills (inducted into the Country Music Hall of Fame in 1968), legendary producer Don Law (inducted into the Country Music Hall of Music in 2001). 508 Park is perhaps best known for its association with Mississippi Bluesman Robert Johnson (1911-1938), who reportedly made his second and last recording there. With the future development of the new convention center hotel and potential plans for light rail transit in the area, and vacant space in near-by historic buildings, Preservation Dallas hopes that a new owner will seize the opportunity to take advantage of federal preservation tax credits and redevelop these historic properties. Along with 508 Park, several historic structures bordering the Harwood Historic District were included in this year’s list. Visit the Preservation Dallas website for more details about the list.